The New England Patriots limp home after a 0-2 and uncharacteristically poor start on the road for 2018. The team is just 1-2, and although we’re used to seeing slow starts from the Pats in September, this week’s game, because of that slow start takes on very high significance. Miami enters the game on a roll at 3-0 and is two games up on New England in the division. A win in Foxboro, where Miami rarely wins will put the Dolphins up three games plus the tiebreaker which puts the Pats far in the rearview mirror. No one picked Miami to make much noise this season, Adam Gase has his team believing and this is a big benchmark game for them. The Patriots are searching for answers both offensively and defensively. Injuries are have already ravaged the team after just three weeks, with nearly their entire draft class of 2018 on IR. This is an even bigger game from New England’s point of view. They can ill-afford to drop a home game against a divisional opponent, and one that is already two games up on them in the division. The Patriots traded for Gordon less than two weeks ago and his every move has been scrutinized despite being slowed by a hamstring problem that has left him limited in practice. And with that issue, along with him trying to learn the offense, would lend itself to lowered expectations, at least initially. But the opposite is actually in effect here. Many people believe that Gordon is going to light it up immediately in Foxboro as soon as he hits the field, even if they have just a small package of plays for him to start. Truthfully, whether you loved the trade or hated it bringing Gordon to New England, putting so much on this player’s plate after having barely played in the NFL for the past five years is a tad of a reach. But at this point, after such a buildup, we just want to see him on the field now. The Patriots picked up the former Colts DE/LB this week and although he will only get a few days of practice, we do expect to see him on the field. Simon has had production in the NFL and was let go because the Colts were changing their system and his talents didn’t fit the direction they were going. Which leads us to the intriguing question, how do the coaches visualize using Simon? He’s at his best as a 3-4 outside linebacker and wasn’t greatly suited to be a 4-3 defensive end, hence his release from Indy. The Patriots have been primarily a 4-3 team, although Bill Belichick hates being pigeonholed. So, does this mean we’ll see some 3-4 looks or even some of those five-man fronts we’ve seen in the past? Possibly, and with the issues they’ve had stopping the run, something had to be done. Simon does have some talent at rushing the QB and setting the edge in the running game which is very important moving forward. It will be intriguing to see how Belichick and Brian Flores decide how to use Simon here. The Patriots Swiss Army Knife of the offense had his looks and snaps curtailed a bit as the team was pushing Sony Michel, trying to shake the rust off of him after the rookie running back missed nearly a month of training camp, all of the preseason and the first game of the year. Now, they need the veteran to step up his game. White’s versatility in the passing game will be put to the test this week. With the Patriots wide receivers struggling to win 1-on-1 matchups, the running backs will be looked to even more to take up the slack. Rex Burkhead was a favorite receiver of Tom Brady’s but he’s injured again and on IR. Michel is just finding his feet in the NFL so White will have to step up his game again. Look for White to get a lot of looks against the Miami secondary this week. Brady will try to isolate him on a linebacker and create favorable matchups to keep the chains moving. White can also chip in with the running game but this week, they need him to get 7-10 catches out of the backfield. Last week, the Patriots really missed these two starters against the Lions. Flowers is their best defensive lineman and arguably their best defensive player period. He’s excellent in run support and is a good pass rusher off the edge. Chung is outstanding in run support down in the box and has always given good coverage against opposing tight ends. With the defense reeling, they need both back this week. They both were in concussion protocol last week and missed the game in Detroit, and both have still been limited in practice this week. Having the two of them back for this game will be a big boost for a defense that is in search of a spark. We’re looking for them to bounce back this week and play solid against a talented Dolphins offense. We’re watching the Flowers matchup against Miami RT Ju’Wuan James this week. If the Patriots are going to be successful, they’ll need Flowers to get the better of that one on Sunday afternoon. The Patriots big tight end has been off to a slow start during the past two games and the Patriots offense needs him to get it going. 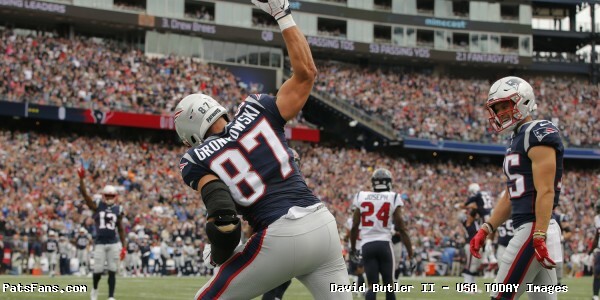 Gronkowski is a force multiplier when he’s on top of his game, it elevates the rest of the offensive players around him. There are already some rumblings that he can’t run anymore, and that he needs to build up his speed down the field. Comments like that are always good fodder to get the competitive juices flowing even more. Perhaps the addition of Gordon, if even for a few plays this week, will open up just enough space for Gronkowski to get his game back on track. There is nothing like a little home cooking with the crowd at Gillette to ignite the big man and awake this slumbering offense. Brady will be looking to get him involved early and often in this one. This entry was posted in 2018 Patriots Regular Season, NFL Commentary, NFL News, Patriots Commentary, Patriots Injuries, Patriots News and tagged 2018 NFL Season, 2018 Patriots season, Bill Belichick, Chris Hogan, Danny Amendola, Dont'a Hightower, James White, John Simon, josh gordon, Ju'Waun James, Miami Dolphins, New England Patriots, NFL, Pat Chung, Patriots, Patriots edge rushers, Rob Gronkowski, Ryan Tannehill, Tom Brady, Trey Flowers on September 28, 2018 by Steve Balestrieri.